Today, without a hint of shame, The Canadian Museum for Human Rights continued down their pollyanna path, where nothing has ever been wrong in their world. Media reports carefully omit which donors- crown agencies? another bank? Global TV employees? - finally pushed the deadweight that is the CMHC over their original $105 M fundraising goal. The compliant media regurgitates the official spin, that Gail and her Friends only discovered the concept of "construction inflation" and "over-budget" two months ago. But the MSM failed to fairly cover the story for years, and it was only the pressure from a series of reports by blogger The Black Rod that finally forced Asper to spin a tale of woe to the publicity arm of the CMHC, the Winnipeg Free Press. Today, without shame, she proclaimed they would simply get out their tin cup and ask the public that is too wise (to the millionaires, no doubt too apathetic) to fork out more dough, through her good friends in government. The Sun story reinforces our view of the delusional mind-set of the upper crust - the CMHR seeemingly describing the federal Conservatives intention to hold the Friends to their word as "more or less" having told Gail et al to drop dead. Clearly the fact that her chum, Premier Gary Doer ,didn't ask the any taxpayers before doubling how much Manitobans would pay to $40 million doesn't bother the rich, in fact it encourages them. They expect he'll obligingly cut a cheque for another $7M without asking you. So the CMHC press release first attempts to seduce the cash-strapped City of Winnipeg for ANOTHER $3 Million. Taxpayers want accountability and a firm number for the entire capital component of this project. Until I am convinced we have an accurate total costing for the project, I am opposed to spending any additional taxpayer money it. Can someone please provide me with a reasonable explanation why construction activity still continues at the future site of the Canadian Human Rights Museum WHEN there STILL exists a $45M shortfall in secured funds? What backroom deals have been agreed to to allow this to happen? Backroom deals by politicans who are too embarassed to admit that they have promised MORE taxpayer dollars to make this project work. Do you think that in a New York minute the private lending industry would release funding for a project of this size WITHOUT all funding in place? Not on your life. Marty please ask the question! If you missed any of the 8 episode, guest-host stint by Marty Gold on CJOB's Nighthawk talk show, here is the list of guests and topics. 10.30 PM US Independance Day with Tina G.
11.30 PM - Update from 12 year old Aiden- pool rules changed or just optional depending on the lifeguard? 9.30 PM Chief Ron Evans clip from RCR Reports this morning- are the chiefs too scared to stand up to the Indian Posse ? A reminder that we are collecting suggestions for the naming of Marty's new grandson, with the most creative name as determined by the official arbiter - mommy of said grandson - awarded a copy of Retropeg, a photographic look at the city in the 70's. TGCTS has learned that a Winnipeg businessman is challenging a ticket and tow-away from the Winnipeg Parking Authority, armed with evidence from City Hall that tags issued since November may have been illegally issued. According to the man, and another sources, the WPA may have made a fatal miscalculation when they split with the Corps of Commissionaires and issued a contract so onerous with penalties that the Corps refused to bid to renew their long-standing deal to patrol Winnipeg streets and laneways. The employees of the winning bidder, G4S, are NOT sworn peace officers, and the Commissionaires that carried on duties by joining the private security firm lost their peace officer status by doing so. The City sent a letter to officials asking them to clarify the question months ago but it is unclear if they replied. However the man challenging the ticket told TGCTS that he went to see the WPA and asked, are the tickets being issued by sworn peace officers as required at the top of the tickets? and he told us "they turned white" and refused to answer. He saw a magistrate with a copy of the letters sent by the city raising the possibility this was a problem; the court case is set for August and we'll follow the story. If his ticket is dismissed, this would mean every ticket issued by G4S would have been without authority, and the city could have a Refundgate 2 scandal on it's hands. Not to mention the question, would the tow truck companies who executed instructions to remove vehicles, technically have committed grand theft auto? TGCTS will have more on the WPA with Coun. Jeff Browaty today on TGCTS, and on The CJOB Nighthawk at 9 PM tonight. Also on the Nighthawk, Sel Burrows has harsh criticism for Justice Minister Dave Chomiak for choosing to add to jail facilities rather than deal with the remand backlog; and Barrett Fraser of Triallo Communication Media will explain their exciting foray into the city scenescape - contest time! - at 10.30PM; with Paul Lazenby of BODOG fights speaking about the fight to legalize MMA in Canada at 11 PM. The tired, old MSM excuse "it's summertime and there is no news to report" was blown out of the water yesterday on both AM and FM talk radio. On TGCTS in the drive time, Coun. Jenny Gerbasi told the Kick-FM audience why she felt the process to establish a water utility was being rushed. At a time of year when so many Winnipeggers are on vacation and unplugged from new media, councillors are in a position of voting on a proposal that would remove accountability from them not only for water rates, but for any future deals with outlying municipalities -- and even opened the door for fee-for-service home garbage collection. Today, the Winnipeg Free Press editorial "Water utility muddle" echoed Gerbasi, stating "it's getting hard to believe that all 15 councillors and the mayor are fully prepared for the important decision they are about to make", concluding, "Unless there is a need for a decision on July 22, council should consider postponing the vote until September so it can ensure that all councillors, and the public, have a clearer understanding of the plan." Then last night on CJOB's Nighthawk, Conservative leader Hugh McFadyen outlined how far the opposition is willing to go to force Elections Manitoba to fess up the details of the arrangement to forego prosecution of the Doer NDP just before the 2003 election call. The NDP was caught submitting forged documents in a rebate scam stemming from the 1999 election. McFadyen revealed to CJOB listeners that the auditor David Asselstine stumbled across the most blatant clue - the "expense" being claimed, wages paid to as-yet-unnamed unions for their workers supplied to the NDP campaign, was paid for by a cheque, written the SAME DAY a cheque in the same amount was "donated" back to the NDP by the unions. The cheque-swap resulted in the actual cost to the NDP being zero-- but the arrangement was concealed in the official filings to make it look like the party was eligible for approx. $76,000 in taxpayer support to help repay the campaign expense. The official agents at the constituency level, who prepared the documentation for party headquarters to review, were unaware their work was altered when it was presented for their final signature. According to Finance Minister Greg Selinger, this sleight of hand was standard for the NDP to falsely garner refunds for non-existant expenses since the 1980's, which would include the entire time Gary Doer has been party leader. McFadyen said that options included going to court or even to the new Lt.-Governor Phillip Lee seeking redress, and he emphasized that Manitobans need clear answers about why Elections Manitoba allowed the NDP to defraud taxpayers without penalty, as their impartiality is justifiably in question. The story of the Winnipeg Regional Health Authority scramble to control and stifle questioning of their pay raises was heard on both TGCTS and the Nighthawk yesterday. It turns out a letter to the editor written by a doctor, did not reveal that said doctor is actually a director of a program for the WRHA, and not in private practice. When the doctor was called and offered the opportunity to go on radio and explain her asssertion that the head knocks of the WRHA are hard working and deserve every penny, she insisted that the invitation had to be vetted through the WRHA spin doctors (themselves beneficiaries of handsome pay increases even though they do not save lives and there is no proof they are 'heavily recruited' by other health agencies). The communications expert commenced to lecture that any requests to interview doctors had to go thru head office, even though she confirmed the letter at issue did not require, or have, prior WRHA approval. Even though the doctor could have refused the invitation when we spoke to her yesterday morning, it was left to the word-bending professional, on the taxpayers' dime, to act as publicist for the doctor's private matter and refuse the opportunity to set the record straight. If you think it's tough to understand why the WRHA insists they control the media speaking to doctors about non-WRHA related actions such as letters to the editor supporting the entitlements of Doctor-bosses like Brian Postl and Brock Wright, try to figure out why the "Public Sector Compensation Disclosure" report is not available online, or why no announcement of its release is found anywhere on the WRHA or Manitoba government websites. Meanwhile, no word yet from the spin gang on Main Street about our request to have any- ANY- spokesperson from the WRHA Board of Directors come on the CJOB Nighthawk this week - we offered Tuesday, Wednesday, or Thursday - and explain to open-line radio listeners why, for instance, Postl is worth $418,000 a year given the scandals and secrecy that have characterized his reign. more on the water utility proposal, negative feedback from David Asper's football stadium at the U. of Manitoba open house, and the WRHA. And, the interview with Citi-FM's H!- Howard Mandshein, which we couldn't fit in to yesterdays show. 9 PM, Coun. Jeff Browaty in studio, 10 PM Global TV reporter Meera Bahadoosingh, and 11 PM, Today in History with Professor Levinski. Coun. Jenny Gerbasi will explain her concerns about the proposed water utility at 4.30. And, I will have lots to say about the WRHA compensation report, and who is worth -- how much?? PC leader Hugh McFadyen at 9 PM, we'll discuss the Elections Manitoba scandal, the WRHA pay scale, and gang warfare on the streets of the city. and at 11 PM, another edition of Today in History with Professor Levinski. Thanks very much for all the listeners who have commented about both shows recently. I was so blessed this Canada Day to be able to enjoy the day in such a unique way. During the sunny afternoon, I tracked the Osborne Village Street Festival enjoying the sights and sounds, seeing friends like Marshall Dana and Dave Shorr - happy birthday, Dave's dad! - music producer Chris Burke-Gaffney, Tammy my favorite waitress, and of course Chuck, David and Coleman, the Brothers Green, at the Osborne Village Inn, stage-managing the circulation of beer, entertainment and great memories (a special thanks from them and the Biz to Sgt. Bob Irwin and the Winnipeg Police Service for their efforts to keep the festival the safest and best family event in the city!). Danny's Whole Hog outlet was a steady business of carnivores; nearby Andrew and Paula Debenham were handing out pamphlets and explaining their First Aid Training Centre concept to a surprisingly receptive audience; down the block at 120 Osborne, Fabutan, bless em, was handing out free sunscreen and advocating responsible tanning. Northbound, outside of Noir, I bumped into Councillor Jenny Gerbasi navigating the sea of celebrants at River and Osborne. Not only got as voicer for the Nighthawk on CJOB, I confirmed her appearance on TGCTS next Monday. The water utility proposal will get a full working over that day. South of Stradbrook, Vintage in the Village gave me a copy of Captain Canuck, the Winnipeg comic book from 1975, to give away on Kick-FM next Tuesday. 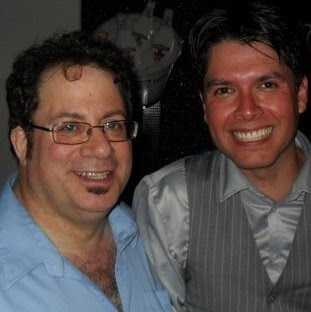 One of my mentors in broadcasting, Howard Mandshein of CITI-FM, showered me with praise for my work in the talk realm, and introduced me to Kevin Donnelly of the MTS Centre who books in all the fabulous top-line music acts. Kevin graciously said a few words for broadcast later on CJOB. The feature attraction at the Zoo stage, was Derek Miller, and he followed up his electric performance the night before with an amazing exhibition of jazz, rock, and rock-a-billy infused blues. He is the best act in the country right now. 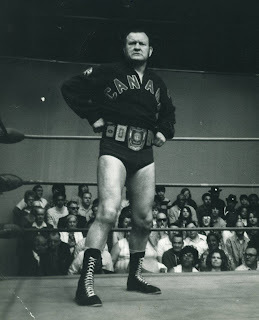 That night at 9.30 PM on CJOB, the thrill of my sportscasting career was achieved when Canada's Greatest Athlete, Gene Kiniski, proved wrestling has no script when the former world champeen pontificated at length about this country, where it has been and where it is headed. So much for asking about Don Leo Jonathon and Verne Gagne. Strong on the issue of low-cost education for all, Gene also explained his surprising role in the flag debate and proclamation of a national anthem. In a 1956-ish national CBC telecast of the bouts from Toronto, the former footballer from Edmonton decried that a country so vast and strong should stand at attention for a flag and anthem of another nation (the Union Jack and God Save the Queen). Liberal cabinet ministers Robert Winters and Lester Pearson seized upon the outcry and Kiniski had influenced the national psyche. After a day off the airwaves, I will return to CJOB tonight with a roster of fine guests and features, including Sean Crawford of MacDonald Youth Services; Brandon Sun managing editor James O'Connor; the latest installment of "keep your eye on the ball" -- the WRHA's attempt to divert public focus onto the salaries paid to life-saving emergency room doctors, rather than on the executive's own unjustified pay raises; a special look at the 4th of July festivities down south with special correspondent Tina G from L.A.; and another edition of Today in History with Professor Levinski. We've already made news by cross-pollinating public affairs between both shows - check out what Policy Frog has to say about the spat between Mayor Katz and the MGEU, that started on campus radio and got ratcheted up on the AM band. and at 9 PM Monday on the CJOB Nighthawk, I'll be joined by Progressive Conservative leader Hugh McFadyen.